Mickey is a beautiful Chocolate Toy Poodle. Mickey is from Champion Lines and has over 20 Champions in his pedigree. He is a really sweet boy that is super sweet, playful, and affectionate. He loves to sit in your lap and cuddle as well. Mickey has a beautiful dark brown, curly coat. Kobe is a Chocolate Merle Small Miniature Poodle. Kobe is also a sweet little guy. He loves everyone and gets along well with the other males as well. He has a beautiful curly coat. His Merle markings are just lovely. He has really nice ear leather too. I just love the contrast in his Merle color patterns. We hope to see some Chocolate Merle litters from Kobe in 2014. Ray is a Sunshine and Razz puppy. Ray is a beautiful red male from a really nice line of red toy poodles. He is super sweet and loving. He is smart as well. He has a color bred red pedigree with 10 champions from Koehl’s, Sa’man, and Sharwood. Ray will have puppies in late 2016 - 2017. 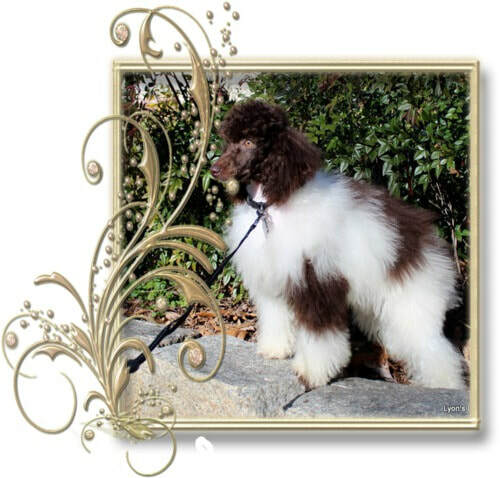 Charlie is a beautiful Chocolate & White Parti Poodle. Charlie is a miniature size and will be around 15 pounds grown. We will welcome him into our breeding program in the summer of 2019.